Our spiritual connection should have been our birthright but much of the mainstream religious spirituality we are fed is a watered down version of the truth at best. The rules and dogma of religion turn people off and many dismiss it at a young age or lose interest in it. However, people are now reconnecting with true spirituality and everything is becoming more transparent as the light of the world illuminates the shadow energy. We are seeing lies, corruption and shadow energy being exposed everywhere as the world continues to change. Today I have released a new meditation recording called ‘Spiritual Healing’, which is a powerful way to clear your energetic field of imprints and blocks, and to become more spiritually aligned. I am very excited to hear your feedback on this recording as it is very different from anything I have done before. It has a lot of Shamanic influence and goes very deep in places. Find a quiet room where you will not be disturbed. Turn off your phone and dim the lights. Make yourself comfortable, either sitting in a chair or lying on a bed or sofa. Prepare by affirming to yourself silently or out loud that you are going to make a spiritual connection. Close your eyes and continue to focus on your intention to connect with the divine. It is important to approach this journey in the right space, so just take a moment to clear your mind of all thought and judgement. Now connect with a sense of gratitude for all the good things in your life as well as the challenges which give you the opportunity to grow and learn. Open yourself up to a sense of gratitude for the gift of your life and thank your divine creator for this opportunity to grow and reconnect. Make it heartfelt as gratitude will always take you a long way. One of the best ways to clear your mind and relax is to breathe, so focus all of your attention on your breath and begin by breathing slowly and deeply in through your nose and out through your mouth. Let go of all thought and connect with the feeling of your body as you draw fresh air deep into your lungs. Continue to breathe away any tension and relax more and more with every slow out breath. Now imagine you are breathing in through your heart chakra in the middle of your chest and breathing out love. Project the feeling of love out from your heart, be aware of your body and the movement of energy that begins to flow through every meridian and every chakra. Connect strongly with your heart energy and allow it to expand. If you can’t feel that just know that you are an energetic being and by relaxing deeply you allow your energy fields to replenish and rejuvenate. Continue to breathe through your heart chakra and completely let go and feel yourself floating down into an ever deepening state of relaxation where your sensitivity is heightened. Use this meditation technique for a while and then ground yourself by creating a strong connection to the earth below. So imagine a beautiful pink light coming up from the heart of mother earth into the soles of your feet. And imagine this light moving up your legs and into your spine and running all the way up the middle of your body to the top your head. Imagine the light connecting you to the heart of mother earth below you and as you do this feel very safe and grounded now and back in the present moment. When you are ready open your eyes and come wide awake. Do post your feedback about these recordings in the comments below. i have been waiting years for this! wondered when hypnosis/NLP and spiritual love would meet..in a simple to listen, simple to use way. I live in Zürich and bought the cd “Get Rich and Successful” a couple of years ago when on a trip back home to the UK. I now listen to it several times a day . I am not rich yet, but sucessful! and riches are coming my way! I received my MP3 download two days ago for “Spiritual Healing”. First let me say it is a much easier way to shop. Receiving the link online is swifter than getting an aeroplane and I have already listened to if five times. I absolutely recommend it. I am an Esalen massage practitioner and have worked alot with Chakra blancing and process work. This download works personally for me. I can already feel my energy changing and can feel that old traumas are being released. Wow! What a great and beautiful article it is. After all advancement in technology and trying to make ourself advanced in materialistic things we feel we need mental peace and stability in life and this can be achieved only through meditation and spirituality. I 100% agree with your points and believe that we should go for spirituality at least few minutes daily. 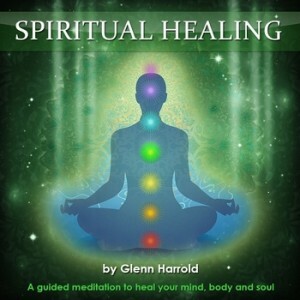 I have listened to several of Glenn Heralds meditations especially to fall asleep. I have been trying to find one that I have listened to that guides you through sinking down into the mattress and into different layers of color. Can you help me with the name?